The America's Cup trophy is returning to New Zealand, where it will be on display for public viewing during the Louis Vuitton Trophy regatta in Auckland. The Cup, which was won one month ago by the American team BMW ORACLE Racing, has been residing in its new home at the Golden Gate Yacht Club in San Francisco. It is scheduled to arrive in Auckland on Tuesday, March 16th. This will be a homecoming of sorts for the America’s Cup, which spent nearly eight years in the trophy room at the Royal New Zealand Yacht Squadron following Team New Zealand’s victory in 1995. The skipper of that team, Russell Coutts, is the CEO of BMW ORACLE Racing. “It’s appropriate that we bring the trophy to Auckland this week,” Coutts said. “Most of the America’s Cup community is in town, including Mascalzone Latino, the team for our Challenger of Record, racing in the Louis Vuitton Trophy. So although we weren’t able to compete in this regatta, we wanted to support the event. The Louis Vuitton Trophy events are the result of a partnership between Louis Vuitton and the World Sailing Teams Association, designed to provide regular, high-level match race regattas in large and complex racing yachts. “It’s great to have BMW ORACLE Racing, one of the founding members of the WSTA, showing their support for the other teams by bringing the ‘Auld Mug’ back to New Zealand,” said Bruno Troublé, spokesperson for the WSTA. “By supporting this event, BMW ORACLE Racing is also paying tribute to Louis Vuitton, which has contributed to growing the America’s Cup so much over the last 27 years, all the while respecting its values, tradition and history. 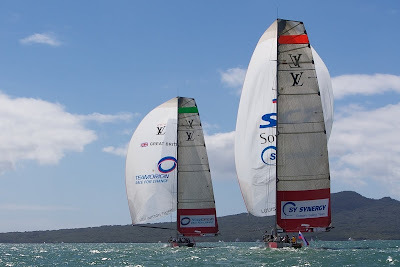 Eight teams are currently racing in Auckland for the Louis Vuitton Trophy. Further events on the calendar include regattas in La Maddalena, Italy, Dubai and Hong Kong. The America’s Cup will be available for public viewing at Voyager, the New Zealand Maritime Museum, at the Viaduct Harbour, on Tuesday, Wednesday and Thursday of this week from 1100 until 1600 (1530 on Thursday). The Museum is putting on special rates of just $5 per adult, with free admission for children 14 and under. (l-r) Ahmed Al Romaithi, Director General, Abu Dhabi Marine Sports Club, H.E. Mubarak Hamad Al Muhairi, Director General ADTA, Knut Frostad, CEO Volvo Ocean Race, Mohammed Al Mahmoud, General Secretary Abu Dhabi Sports Council, Salam Al Romaithi, Deputy Director General Abu Dhabi Marine Sports Club, H.E. Nasser Al Nowais, Chairman Rotana Group. Image copyright Mhic Chambers. An agreement signed in the United Arab Emirates capital, Abu Dhabi, Monday will see the Arabian Gulf’s emerging marine leisure hub become a host port for the 2010-12 race. A racing team from Abu Dhabi will also take its place on the start line of the race in Alicante, Spain in the autumn of next year. “This event will take Abu Dhabi’s marine leisure proposition to the world and will enable us to demonstrate, first hand, our powerful credentials to a highly influential professional yachting audience,” said His Highness Sheikh Sultan Bin Tahnoon Al Nahyan, Chairman, Abu Dhabi Tourism Authority (ADTA), the agreement’s co-signatory. “Via the expansive international media coverage the race enjoys, Abu Dhabi’s name will ride high on another world-class sporting wave,” he added. The agreement, signed between His Excellency Mubarak Al Muhairi, ADTA’s Director General and Knut Frostad, Volvo Ocean Race CEO, takes Abu Dhabi into global yachting history as the first Middle East port to host the event since its 1973 inception. 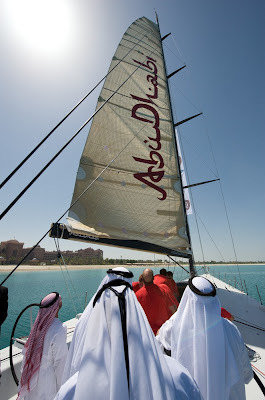 Senior members of the ADTA join race organisers onboard a racing yacht at the Emirates Palace. Image copyright Mhic Chambers. Team Abu Dhabi, a crew specially selected by ADTA will tackle the ‘Everest of Sailing’, in a newly designed boat, which will be built in the UAE capital by the Abu Dhabi Mar Group. The new marina being built at Emirates Palace - the emirate’s signature hotel and among the world’s most opulent - will be the focal point of the host port. Al Muhairi said Abu Dhabi, its fellow emirates and the wider Gulf is expected to get fully behind the event and to welcome the Volvo Ocean Race fleet to the region when the crews arrive in Abu Dhabi at the finish of leg two from Cape Town, South Africa. The remaining host ports will be revealed throughout March. LVT: Green Light for Groupama 3! "We're going to bring rain, with the sky full of contrasts... and we're envisaging an arrival this coming weekend. We set out from Brest (also during a weekend) with a narrow weather window and it was at the back of our minds that it was possible the attempt would come to nothing at Cape Finisterre. As such we're very happy to have got this far, still within the timing and still full of hope! We've managed to remain concentrated on our pace, on preserving the boat and with a pretty decent course in relation to the weather conditions we've experienced. The results are positive, even though it's not over yet. Groupama 3 is a boat which really goes well in the light airs and into the wind, which is something we've really been able to make use of, as much in the descent and the ascent of the South Atlantic... We really believe we can do it! We're eager to see you again." There will nevertheless be a ridge of high pressure to negotiate from Tuesday evening, before joining up with a low which will bring with it SW'ly breezes... It's also possible that these winds may accompany them all the way to the finish off Ushant! As such the wind will ease temporarily, which is why navigator Stan Honey has opted to let them run on a little, by getting a little bit of West into their N'ly course. This will be the final weather barrier then before the sprint to the finish, on a virtually direct course towards Brittany. They have just 2,000 miles to cover now! "Last night went well in the end, with just a short calm spell: as such we're already in the tradewinds, on smooth seas making fast headway without any violence for the boat and the crew! On Sunday we were still in squalls without a lot of wind and Franck was feeling a little doubtful... It's the end of the voyage though and the nerves are always a tad more frayed! We're really keen to get to the finish because our nerves are a little worn and, though all's well with the boat, she is a little fatigued herself. We're still relishing the sailing but it's nice that it will come to an end soon too. 24/ 7 in a confined space with the other guys on a boat which is going fast and is sometimes stressful, means that you can't always be good humoured. 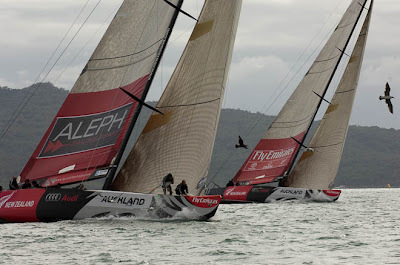 All's well though and right now we're sailing on a single hull in perfect conditions..."
Aleph had the best of the race against Emirates Team New Zealand on Monday. Image copyright Chris Cameron/ETNZ. The French team Aleph was having the best of their race against Emirates Team New Zealand on Monday when ETNZ’s gennaker ripped in the left corner on the first down-wind leg. Dean Barker and crew finished the run under jib. They gained some ground on the second beat but ran out of runway on the downwind leg to the finish. Aleph finished 36 sec ahead. With a five-win, one-loss record for the regatta so far, Emirates Team New Zealand retains its place at the top of the leaderboard. Skipper Dean Barker said Aleph deserved its win today. “They had not had a good run in the regatta so far but they’re a strong team and today the came out really firing. “We were behind, but working hard to close the gap and create some opportunities when the gennaker tore. We hoped the sail would hold, but it didn’t and that effectively ended our race. “We did make up some of the lost ground (Aleph’s lead at the first mark was 27sec, the second mark 57sec, the third mark and at finish 38sec) but on these short courses there’s not much opportunity to recover. In the only race of the day, spectators witnessed an interesting turn of events when the French team ‘Aleph’ took a win from event leaders Emirates Team New Zealand breaking their run of race wins. Aleph were ahead from the start and despite ETNZ suffering a spinnaker rip the Kiwis pushed them hard to the end, and the French team took the win by 38 seconds. The warning signal for race two between TEAMORIGIN and the Swedish Artemis team was fired at 1140. The wind strength was already up to 25 knots and the race start was postponed with 2 minutes to go as this is very much the upper limit for these boats. A long postponement followed while the race boats and teams were sent ashore and the weather monitored. At 5pm local time, the race committee announced the decision to cancel racing for the day due to excessive winds and aim to complete the final flight seven tomorrow and the three unraced matches from today if conditions allow it. Racing will resume Tuesday 16th March, when TEAMORIGIN will race two races back-to-back to complete round robin 1 – against Mascalzone Latino and then Artemis. Strong and gusty sou-west winds forced a cancellation to the day’s competition but not before previously unbeaten Emirates went down in defeat to France’s seventh-placed ALEPH. Milder weather is expected tomorrow and racing will resume with flight seven, the last of the round robin. With an earlier start scheduled, the remaining matches of today’s abandoned flight six will be squeezed into the schedule tomorrow, or on subsequent days. Four teams crowding the top of the points table were slated to square off today. Britain’s TEAMORIGIN, placed second-equal, was circling in the start box against Sweden’s third-placed Artemis with just two minutes to the start when the race committee signaled a postponement. The Italian teams Azzurra and Mascalzone Latino, each placed second-equal, were waiting in the wings for the third race of the day. The Synergy Russian Sailing Team, winless in Auckland despite a good race record in Nice last November, was scheduled to race the German/French All4One, which is the other team in second-equal place. After sending the race boats back to the dock, the Royal New Zealand Yacht Squadron race committee, headed by American Principal Race Officer Peter "Luigi" Reggio, remained on station monitoring the weather conditions until 5:00pm before cancelling for the day. Emirates weather man Roger “Clouds” Badham had cautioned this morning that early strong winds would gust over acceptable limits later in the day and curtail racing but the first match started without incident in 19-20 knots from the sou-west with gusts to 23. The race featured two old team mates, each with a good read on the foibles of the other. In 2003 before the America’s Cup in Auckland, Emirates Team New Zealand’s skipper Dean Barker trained with ALEPH’s skipper Bertrand Pacé as the B-Boat helmsman. Later Pacé was Barker’s tactician. At the five-minute gun Barker led deep into the start box, pursued closely by Pacé through a series of circles, before they broke away and lined up to start on starboard with the French boat to leeward and bow out. Barker, who wanted the right, got it, but was forced to tack away into an unfavorable shift. The Frenchman led by two boat lengths at the first cross and continued to extend. “We wanted to play the shifts but we had to be patient,” Pacé said. Beashel explained: “We were on the wrong side of the first two shifts of the first beat. ALEPH did a great job sticking to their game plan and staying in the left and doing well out of that and putting a bit a pressure on us. Then, unfortunately in our gybe-set hoist, we had a little tear in the chute. It was touch and go whether it would hold. Observers rated it as a moderate to major hiccup. Emirates bowman Stuart Bettany went overboard too and joined the pole in the water as the firedrill on deck intensified. Extra crew rushed forward to retrieve Bettany, while others restrained the pole, which was still secured to the mast, to stop it sweeping aft and becoming the fourth snapped pole of the series. Race One: ALEPH def. Emirates Team New Zealand, 00:38 – The day belonged to Pacé as he took the fight to his former sparring partner. Barker fought for the right side and got it, helped no doubt because Pacé wanted the left. 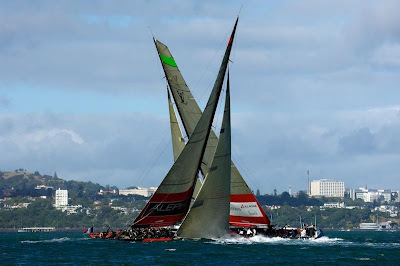 After multiple circling duels they broke away and came to the line on starboard, with ETNZ in the weather berth. The French boat was bow forward and Barker was quick to tack away. The Kiwis trailed into the mark on port, five boat lengths astern. Disaster struck as they trimmed their spinnaker to chase the French. The clew exploded out of the chute, taking metres of sail cloth with it and the Kiwis were forced to dump the halyard and jettison the sail, leaving their chase boat to pick up the debris. They lost about 100 metres, finishing the first run under jib and then clawed back distance on the remaining two legs to finish a very respectable 38 seconds astern. 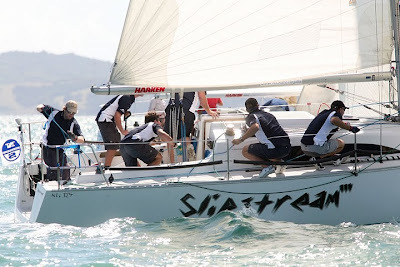 Waka Racing sailing on board Slipstream at the BMW Cup NZ Final. Supplied image. Waka Racing has just won the New Zealand BMW Sailing Cup in outstanding form. After comfortably winning the fleet racing series they proceeded to win the Match racing series in blistering fashion. They now have the right to represent New Zealand at the BMW Sailing Cup World Final. With six fleet races sailed on Saturday in 15 knots of breeze, Waka Racing took a commanding lead in the series. Sailing consistently with the goal of finishing in the top 4 every race the boys never took their eyes off the prize, finishing the day 4 points clear of second place. With the format for the regatta of one days fleet racing then the second day of Match Racing with the top four battling it out for the trophy. They know had the right to pick there opponent for the second round, Semi Finals of Match racing. Waka racing chose Grant (The Butcher) Turnball as there opposition in the first to 3 semi final. With more experience and great team work Waka Racing took him down 3-0 in the shifty southerly conditions off Westhaven Marina. A good start to the day but full focus was now on the final. Entering from the starboard end against Will Tiller we managed to win the start we wanted and controlled the first race, winning by a comfortable margin. Race two didn’t go as well after losing the start we couldn’t gain enough to attack him around the course. Race 3 was close as big shifts were prominent and a lead was never big enough. We lead throughout but got caught near the top of the second beat. Experience shone through as we luffed Will hard and made him tack off at the top mark, gaining a four-boat length lead and the race. Waka racing sealed the deal in race five, as it was a race for the tactician to win, and that he did. After an even start we got the first shift and the lead that we managed to double by the top mark to win the race and the regatta. Waka Racing will now compete in the BMW Sailing World Final in Auckland from the 22nd-25th March against 6 other international teams from Germany, Malta, Hong Kong, Italy, Portugal, and Spain. We look forward to the occasion and the opportunity to defend the New Zealand's title at this event. Please do come and support us off Beam Rock on the 22 and 23rd and then off Westhaven Marina on the 24th and 25th. Thanks to BMW for supporting the event and giving a team from NZ a chance to take on the world each year at this event. Simon Payne (GBR) wins the 2010 PUMA Moth Worls. Image copyright Th. Martinez/Sea&Co. 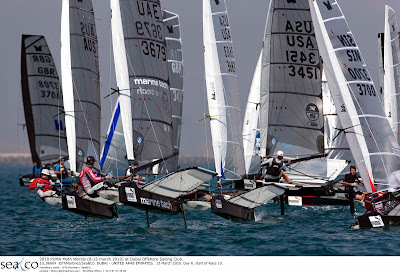 Sunday was the final day of 2010 PUMA Moth Worlds. The Race Committee was forced with an early onshore postponement for lack of wind. After a morning on shore, the breeze in Dubai filled in nicely to get Race 13 off at 12:45 local with a reported wind of 11 knots. Simon Payne led the fleet going into the day. Being the last day of racing, with everything on the line, we saw an aggressive start from the fleet; it appeared that a slew of boats could have been over but only one recorded OCS. Day seven showed the fleet the biggest breeze of the event. Bora Gulari (2009 World Champion, USA) won the pin at the start, showing he still has what it takes. Gulari’s start resulted in him winning the first race of the day. Simon Payne (GBR) had a disappointing first race, opening the narrow gap for Brad Funk (USA) or Andrew McDougall (AUS) to make something happen in the final race, Race 14. Going into race 14 with a bad race, Payne felt the pressure. “When it dawned on me that I hadn't actually won, I put the hammer down” said Payne. McDougall, with his experience, knew what he needed to accomplish to bump him into the number two spot. Winning race 14, McDougall put six boats in between himself and Brad Funk, who was second on the leader board. “In many races I made small mistakes,” sail McDougall, “but in the last one I put it all together, I knew I had to get a first in the last race to break the tie with Brad.” The distance was enough to create a tie at 42 points, and having won the final race McDougall won the tiebreaker with five first place finishes in the regatta. “As a laser sailor the moth is the most exciting class to jump into,” said Funk. “You can sail the Moth for a lifetime and never get it all perfected, there are just so many little things you can change and tweak.” Funk, who is relatively new to the Moth class improved on his 2009 eighth place world finish. PRO David Campbell-James has been impressed and challenged by the Moth class. “The grand prix style racing was fantastic and exciting,” said Campbell-James. "The difference in speed between the boats creates a challenge as how to be a good PRO and create fair racing for all. 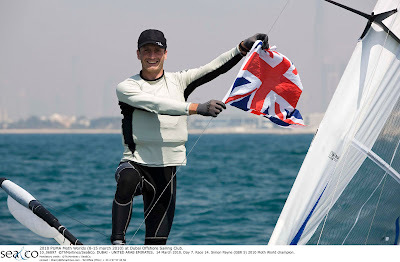 I have been impressed with our gracious host the Dubai Offshore Sailing Club and all they have organized here for us and all the sailors, including a slew of volunteers." 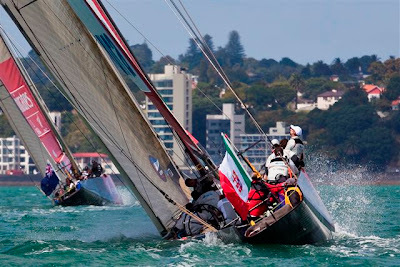 Moth Worlds 2011 will be held in Belmont Bay, Australia in February 2011. 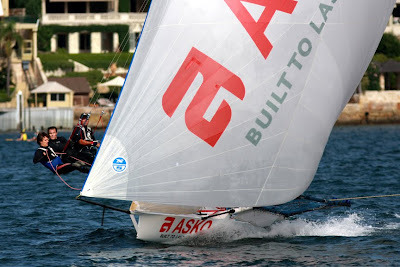 Asko in Race 14 of the Club Championship, 14th March 2010. Image copyright Frank Quealey. 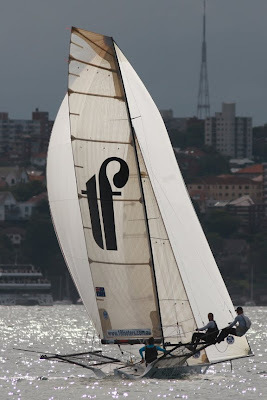 The Thurlow Fisher Lawyers crew of Michael Coxon, Aaron Links and Trent Barnabas took out Race 14 of the Australian 18 Footers League Club Championship in a light Easterly wind on Sydney Harbour Sunday. Thurlow Fisher Lawyers had to overcome a race long ‘match race’ with Rag & Famish Hotel (John Harris, Euan Mc Nicol and Peter Harris) before going on to a 1m1s victory. 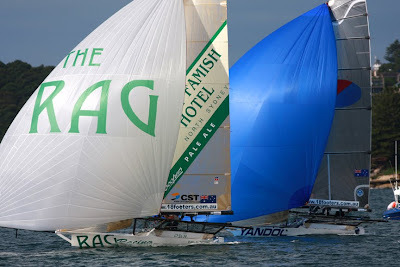 Thurlow Fisher Lawyers and Rag & Famish match racing within the main race. Image copyright Frank Quealey. Their win also puts the team into the overall championship lead, three points ahead of Gotta Love It 7 (Seve Jarvin, Sam Newton and Tom Clout). Yandoo (John Winning, Andrew Hay and David Gibson) finished third, just 9s behind Rag & Famish Hotel. The fleet split soon after the start near Robertson Point with Thurlow Fisher Lawyers leading the group on the RHS of the course and Rag & Famish Hotel leading the group on the left. 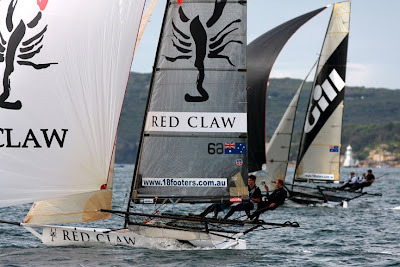 The Thurlow Fisher Lawyers crew of Michael Coxon, Aaron Links and Trent Barnabas took out Race 14 of the Australian 18 Footers League Club Championship. Image copyright Frank Quealey. 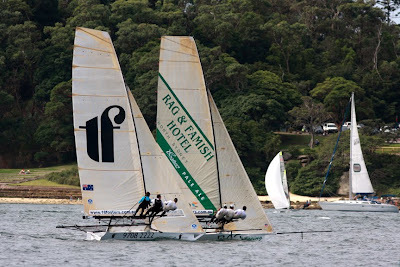 Thurlow Fisher Lawyers led narrowly when the two met and still held a 15s margin at the windward mark in Rose Bay. Club Marine (Marcus Ashley-Jones) was nearly one minute further back in third place, ahead of Yandoo and Appliancesonline.com.au, being sailed by replacement skipper Micah Lane. Thurlow’s margin was down to 4s at the wing mark, then in the shifting breeze ‘The Rag’ grabbed a 20s break at the bottom mark. Rag & Famish Hotel and Yandoo. Image copyright Frank Quealey. 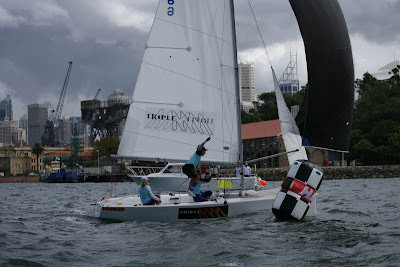 With the two leaders holding a clear margin over the third placed Yandoo, a match race developed on the following windward beat back to Rose Bay. The pair were side by side nearing Shark Island before Thurlow Fisher Lawyers raced to an incredible 1m15s lead at the mark. Red Claw and Gill. Image copyright Frank Quealey. Once again the pair were together after the long spinnaker run back to Robertson Point where Thurlow Fisher Lawyers led by just one boat length. The pair split tacks on the last windward leg but the margin remained close as the lead changed several times. Thurlow Fisher Lawyers was again superior in the Rose Bay section of the course and led clearly as she rounded the final mark and headed for home. Pure Blonde. Image copyright Frank Quealey. Next weekend is the annual Queen of the Harbour race in which every crew will have an additional crew member – a female, their queen for the day. The last race of the Club Championship will be sailed on Sunday 28 March, which is also the last race of the club’s 2009-2010 season. Up the mast on Groupama 3. Image copyright Team Groupama. The final marker before the finish off the Créac'h lighthouse, the equator was traversed this Sunday at 11h 04' 53'' UTC, after 41 days 21 hours 09 minutes at sea. This equates to a deficit of 1d 02h 04' in relation to the reference time. Such a separation might seem sizeable, but it should quickly be reduced in the tradewinds of the northern hemisphere. Full of energy for the ascent, the crew of Groupama 3 is still just as concentrated in this final phase between the switch of hemispheres and the island of Ushant some 3,350 miles ahead. The last mission for Franck Cammas and his nine crew is to set a minimum time of 8 days and 19 hours to devour the North Atlantic, which amounts to an average speed of 15.9 knots along the optimum course... Such a speed is totally within the grasp of the giant trimaran, which is likely to enjoy some favourable weather conditions for this final sprint, since the NE'ly tradewinds are in position after the Doldrums, the latter of which is situated at around 4°N. "Last night was laborious with some squalls developing incredibly quickly and following what was already a light tradewind. We endured some long spells with just 7 to 8 knots of breeze, which was lighter than forecast by the weather models. At night, without a moon to accompany us, we fire up the radar, which enables us to see any rain squalls that may kill the wind. We did suffer a little bit as we couldn't really do what we wanted in relation to our weather forecast" indicated Franck Cammas at the radio link-up with Groupama's Race HQ. The GPS at (very close to) the equator on board Groupama 3. Image copyright Team Groupama. Reasonably worried by this transition of hemispheres, the skipper of Groupama 3 should soon find something to smile about again as the zone of high pressure, which had stabilised over France, is curling up on itself as it shifts across towards the Mediterranean. As such Groupama 3's trajectory towards Ushant could well be very pure: "It's true that the forecasts are rather encouraging for the end of our trip. However, it's also true that there is sometimes a discrepancy between the forecasts and the reality. The past few hours have been proof of that" continued Franck, who was preparing for a tricky night ahead: "I'd have preferred to traverse the Doldrums by day rather than night as it would have been less active. However, fortunately Groupama 3 is at ease in the light airs." Clearly disappointed, the skipper of Groupama 3 is sure of one thing: the quality of his crew, whose fighting spirit and determination are stronger than ever. "The watches are pretty active. When there are manoeuvres to be performed, there are always seven of us on deck, and then just three are required for trimming: we spend our time racing between the sheets, the coffee grinder and looking at the shape of the sails with a torch. We're trying to claw back a very important few tenths of a knot and, in addition to that, this boat is very sensitive to the slightest trim adjustment: there is quite a lot to do and so we're playing with all that whilst trying to react as quickly as possible to the elements." Mascalzone Latino Audi Team wins against Artemis. Image copyright Mascalzone Latino Audi Team. In the prestart, Gavin Brady inflicted a penalty on skipper Paul Cayard of Artemis, but not satisfied with that, he went and cut the finish line in front of the Swedish team. Racing in 15 knots of wind, it was the most spectacular and adrenaline-filled match seen so far in the Louis Vuitton Trophy of Auckland. It was distressing, at times, watching Sunday's race in webstreaming live: During the first upwind leg, Mascalzone was in hot pursuit, determined not to let the stern of the opponent get away. By keeping close, they could be guaranteed a win, knowing it takes about 40 seconds for a team to exonerate itself with a penalty turn, and having only 7 seconds between them at the first mark. Everything happened at the spinnaker hoist: even if the maneuver by Artemis wasn't perfect, on board the Italian team the clip opened on the spinnaker tack, causing the enormous sail to fly loose, and risked compromising the strategy of the race. The crew reacted immediately, showing a team spirit like no other. Once the recovery was made, they threw themselves into pursuing their opponent, limiting the damage at the leeward gate to only 13 seconds, still enough to secure a victory, because of the pending penalty. The Latin Rascals further reduced the distance in the second upwind leg: at the windward mark, they were again on the stern of Artemis, who didn't have any choice but to delay the spinnaker hoist and wait, in an attempt to offload the penalty. Here was the proof of character on the part of Gavin Brady and Morgan Larson (whose father was on board today as 18th man) who managed to disengage themselves from a risky windward position, eventually rolling the other boat during a gybe and going on to win. Mascalzone Latino Audi Team is now in second place on even points with All4One, Team Origin and Azzurra, whom they will race tomorrow. Only the New Zealanders are in front. Speaking of Italian derby, Gavin Brady wanted to publicly emphasize, at the Skippers Press Conference, his esteem and friendship for his opponent, Francesco Bruni. "We have been together on an America's Cup campaign and he was my tactician on a maxi yacht. I know him well as a person and I respect him as an opponent. For us, tomorrow's race will be like the others, but I can understand the excitement, given it's two Italian teams." Another tough day for Artemis Sunday. In our match against Mascalzone Latino Audi Team, we were penalized for gybing too close in the prestart and this was too heavy of a burden for us to shake off. Monday, Artemis takes on the Brits from TeamOrigin in the second match of the day, following Emirates Team New Zealand vs Aleph (FRA) in the first match. The forecast is still for fairly good winds from the Southwest. 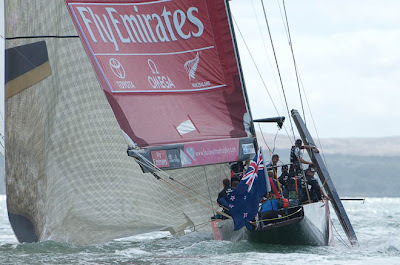 Emirates Team NZ leads Azzurra up the beat. Image copyright Chris Cameron/ETNZ. 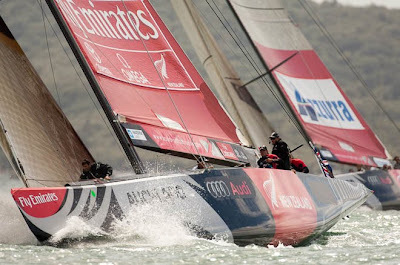 Emirates Team New Zealand has made it five wins in five races to consolidate its place at the top of the Louis Vuitton Trophy Auckland leader board. The margin against the Italian team Azzurra may have been 42 sec at the finish, but the race was not without drama for Dean Barker and his crew. Rounding the first windward mark with a comfortable 50sec lead, ETNZ broke the spinnaker pole at the hoist and completed both downwind legs without one. 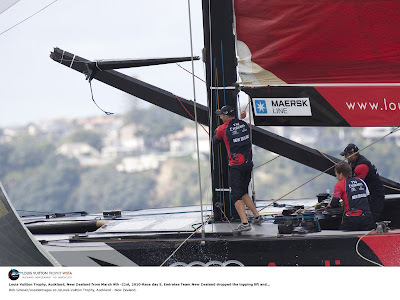 Spinnaker pole issues for Emirates Team NZ. Image copyright Chris Cameron/ETNZ. Azzurra crossed the finish line and dropped their spinnaker in the water. It wrapped around the keel and was damaged. 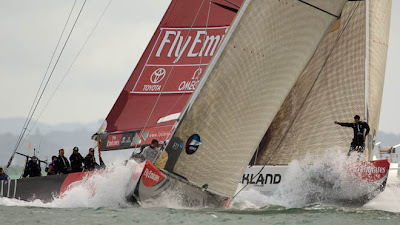 Sail makers at the Emirates Team New Zealand sail loft said it would take at least 20 man hours to repair. But first the sail has to dry and that could take three to four hours. Four sail makers will work into the night. In the boat shed, work started this afternoon repairing the third spinnaker pole to be broken this regatta. Boat builders say it takes about 14 hours to repair a spinnaker pole and it “cooks” fur 12 hour before it’s strong enough to use. Unbeaten in the round robin, Emirates Team New Zealand on five points is alone at the top of the leader board. Each team has two more races in the round robin. “We had a clear game plan to start in the left and protect the left side of the course on the first beat. We managed to force a split tack start, ETNZ on starboard at the pin and Azzurra on port at the committee-boat end." The boats separated to more than a kilometre – Azzurra to the right and ETNZ to the left. At the first cross towards the top mark, Barker and sfterguard were rewarded with a 7 – 8 boat-length lead, which at the mark translated to 50sec. Rounding the mark, they set up for a gybe-set. “It’s a routine manoeuvre and we’re still not sure the cause of the problem, but it might have been a jam in the halyard. The tip-end of the pole went into the water; the pole went into the shrouds and snapped. “We recovered well. The boys retrieved the pole and stowed it safely. Sunday’s 18th man was All Black Dan Carter. ETNZ versus Azzurra in the pre-start. Image copyright Chris Cameron/ETNZ. Azzurra racing on the Waitemata in the Louis Vuitton Trophy Auckland. Image copyright Stefano Gattini/Azzurra. The team Azzurra of the Yacht Club Costa Smeralda Sunday faced Emirates Team New Zealand, the home team and favourite of the Louis Vuitton Trophy Auckland. In the most awaited match of the day Francesco Bruni and his team were unable to conquer this coveted point. The New Zealanders were able to strike their revenge against team Azzurra, who had defeated Emirates Team New Zealand by 2:0 in the finals of the last Louis Vuitton Trophy held in Nice, France, last November. Sunday’s match was held in a very shifty breeze which compromised the performance of Azzurra right from the start. 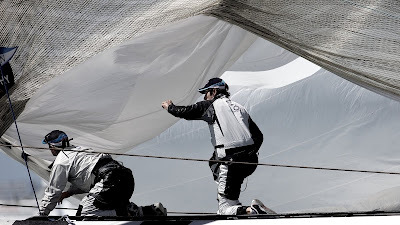 After a split-tack start with the Italians to the right and the Kiwis to the left, Azzurra with Tommaso Chieffi calling tactics, sailed into the right-hand corner of the course, while their rivals went to the left. The oscillating breeze went back and forth, favouring one team first then the other but when the two boats had a lateral separation of over 1km, the wind shifted all the way to the left, leaving the Italian crew trailing at the first mark rounding. 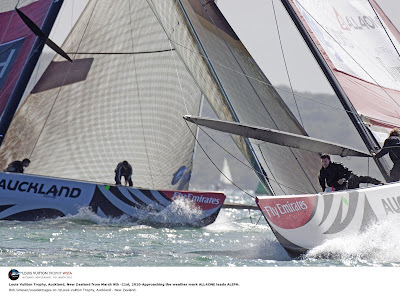 In the spinnaker hoist, the Kiwis made the same mistake that yesterday forced the Swedish of Artemis to retire from the match against Azzurra, but the breakage of the spinnaker pole didn’t affect much the performance of Emirates Team New Zealand. The Kiwi crew was able to keep their rivals under tight control and conquer its fifth consecutive win. With two flights still to go in this Round Robin, Emirates Team New Zealand is the only team yet to lose and leads the overall scorings at five points. Azzurra ends the day at three points, together with All4One, Mascalzone Latino Audi Team and Team Origin. In the other matches of the day, the French-Germans of All4One (skipper Jochen Schümann) beat the French of Aleph (skipper Bertrand Pace); the British of Team Origin (skipper Ben Ainslie) defeated the Russians of Synergy (skipper Karol Jablonski) and the Italians of Mascalzone Latino Audi Team (skipper Gavin Brady) beat the Swedes of Artemis (skipper Paul Cayard). Azzurra Vs Emirates Team New Zealand at the Louis Vuitton Trophy Auckland. Image copyright Stefano Gattini/Azzurra. Sunday the 18th man on Azzurra was the CEO of Mirsky Racing Team, a young sailing team led by Australian skipper Torvar Mirsky who is currently second in the World Match Racing Tour rankings. Francesco Bruni, too, competes with team Azzurra in this important circuit, having won the title of Tour Card Holder for the 2010 season, together with eight other skippers. Competing on this circuit is part of the long-term plan of team Azzurra which sees these regattas as a great training opportunity. Key figures in match racing competitions, including the Louis VuittonTrophy, are the “umpires”, who can inflict penalties without possibility of appeal. The umpires are part of the strong contingent of race officials, volunteers and marshalls (whose job is to position the marks and control the spectator boats) that each day goes to sea with the racing crews, for a total of approximately 55 people. Match racing has very different dynamics and rules than traditional fleet raci ng. Marco Mercuriali is the rule advisor for the Azzurra team here in Auckland. Mercuriali knows very well the spirit and philosophy of this team and of Yacht Club Costa Smeralda, having competed with the first Italian America’s challenger Azzurra in 1983 as a grinder. 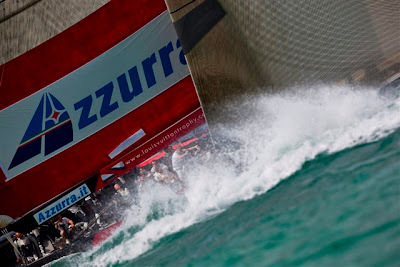 Monday Azzurra will face the other Italian team Mascalzone Latino Audi Team, led by America’s Cup and match race veteran Gavin Brady (NZL) with Morgan Larson (USA) calling the tactics. Monday the teams expect strong winds starting at 18-24 knots in the morning and increasing to 26-30 in the afternoon. On the Azzurra website www.azzurra.it you can follow the race with live TV coverage (with a replay option), listen to the interviews, read the comments of the day and keep up to date with the news flash. The Azzurra Facebook page currently has over 6,200 fans which are increasing day by day. Azzurra takes its name from the first Italian challenger to the America’s Cup which was launched by the Yacht Club Costa Smeralda in 1983. Azzurra finished third in the challenger series in Newport, RI, USA. The YCCS acted as Challenger of Record for the 1987 America’s Cup in Fremantle, Australia. Riccardo Bonadeo, Commodore of the YCCS and President of the current Azzurra consortium was also at the head of the Azzurra challenge in 1983. The new team Azzurra, launched in October 2009, arose from the collaboration between the YCCS and Giovannni Maspero; the team is led by skipper and helmsman Francesco Bruni, supported by tactician Tommaso Chieffi. Francesco Bruni has taken part in two America's Cups and three Olympic Games. Tommaso Chieffi is also one of the best Italian racing yachtsmen, with four America’s Cup and one Olympic Games to his credit. 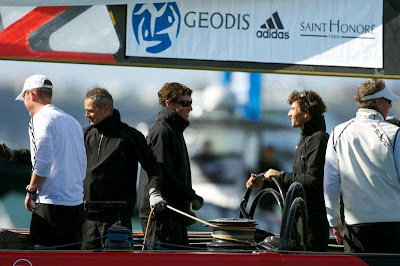 The rest of the crew is made up by match race, America’s Cup and one-design sailors. The Yacht Club Costa Smeralda was founded in 1967 by H.H. the Aga Khan, Andrè Ardoin, Giuseppe Kerry Mentasti and Luigi Vietti as a non-profit sporting association for fellow sailing enthusiasts. The YCCS is renowned for organizing international sailing events such as the Maxi Yacht Rolex Cup, the Sardinia Cup and the Rolex Swan Cup and in 2009 completed one of its busiest seasons – including two ISAF world championships, the Rolex Farr 40 World Championship and the Audi Melges 32 World Championship and three events for super yachts (Dubois Cup, Loro Piana Superyacht Regatta and Perini Navi Cup) in addition to the 20th edition of the Maxi Yacht Rolex Cup. 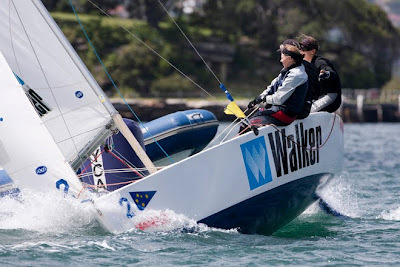 In 2002 the YCCS competed in the Volvo Ocean Race with Team Nautor Challenge, supported by YCCS member Leonardo Ferragamo, with Grant Dalton and Lisa McDonald as skippers of the two boats Amer Sport One and Too, the latter with an entirely female crew. In the past the Club ha s also promoted international challenges such as Azzurra and the motor yacht Destriero, which to this day holds the transatlantic crossing record set in 1992. The Club’s members currently number more than 500. TEAMORIGIN had a close tussle with the Russians on Synergy on Sunday. Image copyright Ian Roman/TEAMORIGIN. TEAMORIGIN won their race Sunday against the Russian Synergy team in an exciting race that was close until the Russians experienced a spinnaker drop problem leaving Ben Ainslie and the British team to take a comfortable win. In the other races today, the all-French derby between ALL4ONE (FRA/GER) and Aleph (FRA) led to a win for ALL4ONE giving them a solid 3 wins and 2 losses so far. An exciting race between Emirates Team New Zealand and Azzurra, currently the top ranked teams on the leaderboard and the Louis Vuitton Trophy Nice finalists saw the Kiwis prevail despite them breaking a spinnaker pole during the race and managing to keep the lead and win by 42 seconds. In the final race of the day, the race between Artemis and Mascalzone Latino provided thrilling excitement to the end, the Swedes incurred a penalty and waited right until the finish line to do their turn, allowing Mascalzone to take an important race win. Start gun for the third race for TEAMORIGIN was fired at 1315 with 16-18 knots reported on the race course. As the two teams approached the line, Synergy came in from behind at pace and tried to put pressure the British team, they both split tacks just off the line with TEAMORIGIN taking a small jump and heading out to the favoured right hand side. Synergy kept pace well as they headed out to the left. The course area today had placed the Bean Rock lighthouse right in middle of the course with a ‘restricted zone’ around that area. This lead to Synergy having to tack across to avoid the restricted area. At the first cross with TEAMORIGIN on starboard, it was pretty close but TEAMORIGIN had a narrow lead and was holding most of the cards as they tacked back to their right side. Synergy was then not able to tack away because of the ‘no-go’ zone of Bean Rock. This manoeuvre further benefitted the British team as they managed to box out the Russians. Both boats tacked onto the layline with Synergy managing initially to hold on to the weather hip of TEAMRIGIN but they were eventually squeezed out by bad air from TEAMORIGIN. At first windward mark, TEAMORIGIN headed round first with 12 seconds lead. Both teams executed bear away hoists but there was a small twist on the gennaker of Synergy. The two teams did a simultaneous gybe and Synergy was trying hard to cast some wind shadow on TEAMORIGIN as they headed downwind. The breeze was up to 15/16 knots but quite flukey so pretty hard conditions to read. TEAMORIGIN sailed smartly to extend to a three length lead, keeping clear ahead but covering their opponent. At the bottom mark Synergy executed a pour drop being set up for the wrong mark and could not get their kite down. The Russians had to sail past the mark before they sorted themselves out and by then TEAMORIGIN’s lead was 48 seconds. Up the second beat, TEAMORIGIN kept their cool and sailed smartly and safely, the audio onboard enabling the spectators to hear the smooth and streamlined communications on the boat and between the crew. By the second windward mark, Ben Ainslie’s lead had extended to 1 min and 7 seconds. The last downwind leg went without incident and TEAMORIGIN took the win by 1 minute and 18 seconds – now giving them 3 wins and 2 losses on the scoreboard. TEAMORIGIN wins against Synergy. Image copyright Ian Roman/TEAMORIGIN. There are two more races in this Round Robin with TEAMORIGIN still to race Artemis and Mascalzone Latino. ETNZ have an undefeated score line with 5 wins but 4 teams now all have 3 wins and 3 points on the board so there is a close battle on for the second golden ticket spot. Crew work on TEAMORIGIN. Image copyright Ian Roman/TEAMORIGIN. LVT: Third Win for ALL4ONE - against Aleph this time - in Louis Vuitton Trophy Auckland! ALL4ONE Sunday won its match against Aleph (5th match of the Round Robin), which allows the French-German team to get a 3rd point on its scoreboard. A point that the team had to win to continue its nice progression in the competition, where it has two important matches remaining to be raced to finish the Round Robin (one tomorrow against Synergy and one on Tuesday against Artemis). This time, Sebastien Col managed to take the team to the right of the race course, according to the strategy that the afterguard had decided for Sunday. After a long leg after the start on the right, ALL4ONE came back to make the first cross in front of Aleph, sending them back to the left side of the race course by then. ALL4ONE then continued to control the right side of the race course, using the wind shifts, so that the French-German team managed to take an important advantage which grew even bigger at the end of the first upwind leg, after having pushed Aleph to do two more tacks. ALL4ONE rounded the first mark 30 seconds ahead. The team continued to increase its advantage while controlling Aleph all along the race, and ALL4ONE crossed the finish line 1 minute and 6 seconds ahead. Jochen Schümann, Skipper and Sports Director for ALL4ONE: "All these races are very tough. And I think that in contradiction to yesterday's race against Emirates Team New Zealand, this was an important race because we had to make this point for the overall result. That's why we had a clear plan to start with speed and stay out of trouble with them so that we have a race over the whole length of the course, and I think we really fulfilled our plan there: full speed start, sailing on the lifted tack first, then we had a little gain already which made the race looking very easy from the outside, but we sailed well the shifts and we kept gaining and gaining, so very good race wise. Everyone feels more confident; every race here is kind of a practice for us. That's the same for all the teams. I think the quality of racing gets higher and higher, and I guess the guys that didn't do that many points probably also get more aggressive each race so, the intensity of racing increases." ALL4ONE will race against Russian team Synergy Monday for its 6th match in the Round Robin. Approaching the weather mark, ALL4ONE leads Aleph. 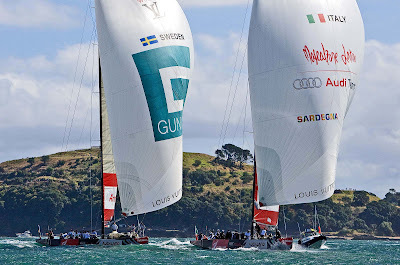 Image copyright Bob Grieser/www.outsideimages.co.nz/Louis Vuitton Trophy Auckland. With just two days of racing remaining before the end of the round robin, a hungry pack of four teams is in equal second place, each with three points and fighting to catch the thus-far unbeatable Kiwis. They are All4One, representing Germany and France, Azzurra and Mascalzone Latino Audi Team from Italy and the British-based TEAMORIGIN. Conditions were ideal for racing with almost flat water and a southerly breeze that ranged from 12 to 20 knots with some big shifts and puffs. Peter Reggio’s race committee from the Royal New Zealand Yacht Squadron got off four races with time to spare even after pauses for boat repairs and commercial shipping. Emirates got an extra share of the limelight today when it hosted All Black rugby football star Dan Carter as 18th man, and when it broke a spinnaker pole during a hoist, the third fracture in the regatta in as many days. The Kiwis shrugged it off, losing only a few seconds in their match against Azzurra and setting their spinnaker without a pole. Spinnaker pole breaks on Emirates Team New Zealand - but they still win, again. Image copyright Bob Grieser/www.outsideimages.co.nz/Louis Vuitton Trophy Auckland. Carter put in a lot of extra time comparing rugby to sailing action for the media microphones and signing autographs for the crowd that gathered in the Louis Vuitton Village in Market Square when he came ashore. His verdict? He was impressed by the teamwork and amazed at the intensity of the sounds of a Cup boat complaining under full load. Brady said that about 35 seconds was needed on the short courses of the Louis Vuitton Trophy for a team to exonerate itself with a penalty turn. The other boat had only to stay close to guarantee a win. After the start and while they were racing it was vital not to be lured into a penalty situation that would cancel the first. Race One: All4One, def. ALEPH, 01:06 – The breeze was 14 knots from the south, sou-west as the all-French team of ALEPH met the German/French All4One. After an intense pre-start in which Bertrand Pacé at the wheel of ALEPH attempted to get a hook on his opponent, it was the combined team steered by Frenchman Sébastien Col that grabbed control of the right as the boats split at the start. On the first cross All4One led narrowly and ALEPH had to duck but that was as close as she got. Bolstered by the local knowledge of her Kiwi tactician John Cutler, All4One extended her control. “Our start strategy was to stay to the right of our opponent but the first thing we wanted was to be going full speed when the gun went,” Cutler said. “We started on port which was the lifted tack. That took a bit of pressure off us. We just had to wait for the next shift to come our way. When we crossed, Sébastien did a very nice job on a slam dunk on Bertrand Pacé and we were again on a very nice shift. The leader had the option to sail on the wind shifts and the trailing boat really didn’t have a lot of choice.” With yesterday’s Umpire decision, penalising them one point, ALEPH shares the bottom of the table with zero points. Race Two: Emirates Team New Zealand def. Azzurra, 00:42 – This was the opportunity for Italy’s Azzurra team skippered by Francesco Bruni to level the points lead with Emirates Team New Zealand if they won. Dean Barker’s host team offered the Italians a slender opportunity when they broke their spinnaker pole at the first weather mark but it was still a one-sided match. Riding as 18th man on ETNZ, New Zealand rugby star player Dan Carter got a close up view of Barker’s surgical tactics before the start. Barker wanted the left and fought for it. The Kiwis got under the transom of the Italian boat to control them before the gun, then headed out to the left at speed while Bruni could only tack away and go right. They were 1,000 metres apart on the short harbour course before the Italians came back to trail by eight boat lengths at the first mark. 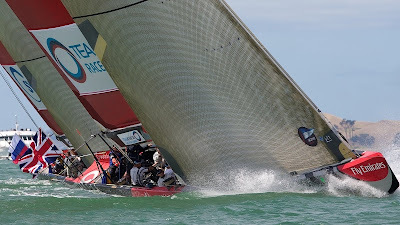 The Kiwis showed a crack in their impeccable crew work as the spinnaker pole end dropped overboard at the hoist and broke as it wrapped around the shrouds. But the chute went up as planned and they sailed both runs with the spinnaker clipped to the bow. The finish delta was 42 seconds and the Azzurra team drowned their spinnaker, if not their disappointment, when they trawled it overboard while dropping after the finish. Race Three: TEAMORIGIN def. Synergy Russian Sailing team, 01:18 – Karol Jablonski, Polish skipper of the Russian boat, has a reputation as a tenacious and sometimes unconventional starter, as Ben Ainslie and the British TEAMORIGIN crew were reminded today. 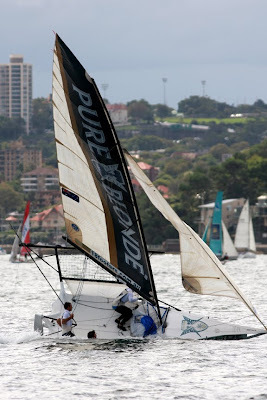 Jablonski had the favoured starboard tack entry and after losing a preliminary pre-start skirmish he was able to grab control and start where he wanted on the left and force Ainslie away. The expected left shift never really materialized and the British boat led when they first closed tacks. Jablonski kept in touch around the first two legs and the Russians only trailed by four boat lengths at the end of the first run. Problems getting the spinnaker down cost them heavily and the British boat had a 400 metre margin at the finish. Race Four: Mascalzone Latino Audi Def Artemis, 01:03 – The pre-start struggle saw Paul Cayard’s Artemis, steered by Terry Hutchinson, penalized for gybing too close. Cayard was blunt. “It was not, in my opinion, a foul!” Brady, steering ML Audi, saw it differently. “In this game the rules are pretty strict and we’ve got umpires watching us. He couldn’t quite get his boat onto starboard. He was desperately trying to but the rules of sailing say the sail has to be set and he couldn’t get his sail through (in time).” Artemis led off the line to control the first beat and was leading by less than a boat length at the top mark until a very untidy situation on ML Audi when the spinnaker flew loose from the tack. Brady’s boat lost five boat lengths but pulled it back on the subsequent legs to overtake Artemis on the last run, surviving an Artemis protest as they sailed through the Swedish boat’s lee. They came to the line together with ML Audi one length clear ahead. The finish delta after the Artemis penalty turn stretched out to 1:03. The fleet at the PUMA Moth Worlds in ´Day 6. Image copyright Th. Martinez/Sea&Co. 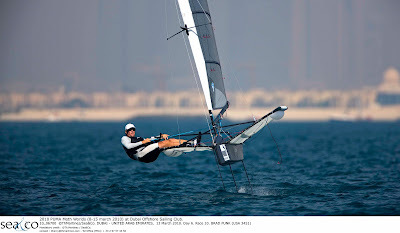 Three races were held Saturday for the Puma Moth World Championships in more light winds off the coast of Dubai Offshore Sailing Club. Along with most of the competition, UAE resident Glenn Raphael has been surprised by the light conditions this week. "It's pretty testing out there. Most of our training has been in the 12-15 knot range, and we've just had very little practice in these conditions," said Raphael. "Still, I'm having fun and that's what really matters." With only one day remaining, Simon Payne (GBR) tripled his three point lead from yesterday over Brad Funk (USA). "It's damned hard work, and I guess I've got a good lead but I can't seem to win a race out there," said Payne, regarding his performance. "I'll look at the board, won't be doing anything differently, maybe have a few beers, read my book, then go to bed." Funk, who earned two come-from-behind, first-place finishes for the day had a 13th in the second race, making Payne's lead all-but untouchable barring catastrophe. Brad Funk (USA), Anna Tunnicliffe's husband, on Day 6 of the PUMA Moth Worlds. Image copyright Th. Martinez/Sea&Co. Andrew McDougall (AUS) continued his strong performance with a decisive victory in race two, lifting him over Arnaud Psarofaghis (SUI) for the final spot on the podium with just two races left in the 2010 championship. Psarofaghis had a disappointing performance, his worst of the week, with a 17th and a 15th on Saturday. Amazingly, the first and third-place racers are among the oldest in the fleet. Payne (45) explains that "age isn't a barrier unless you think it is. You've got to stay fit and do your own thing and you can do well,”he said. "Who says this is a young man's game?" said McDougall. "Our average age is 50 years old, and we're not getting any slower either." After making major changes to his boat, top level pro sailor George “Bear” Peet (USA) had his best day of this championship with two solid top ten finishes, but he remained baffled by the conditions. "There's no rhyme or reason to the wind. You can sail 20 degrees higher and faster than a guy 10 feet away from you. It'll make you go crazy.” With so much experience in sailing other classes he explains that “Moth sailing requires every aspect of your sailing ability to be at the top if you want to do well in this class. It's made me so much better in my other sailing." In the women’s division, Emma Aspington (SWE) has opened up a 17 point lead over Kirsten Sommer (UAE). As the event has progressed both have gotten quite a bit faster. "This is one of the best regattas I've ever been to in any class. The people are so nice and helpful but it is still extremely competitive,” said Aspinton. These women have been sailing impressively consistently finishing in the middle of the men’s fleet. Two races are scheduled for Sunday, the final day of the 2010 Puma Moth World Championship. Samatha Osborne and crew in action at the Harken Women's International Match Racing Regatta. Image copyright Andrea Francolini. The kiwis won their semi-final against Olivia Price and crew who were sailing on home waters, by 2-0, and went on to face another Sydney team led by Lucinda Whitty in the final of the Harken Women’s Match-Racing Regatta. Whitty and crew took the regatta win with a 3-0 victory in the final, but the official report explains it was no easy win for the Aussies. “It was a shifty day out on the Sydney harbour and racing was close,” reports the kiwi team after racing concluded yesterday. Ten teams were competing at the ISAF Grade 3 event including four from New Zealand, five Australian teams and one from the USA. Next best placed of the kiwi teams was Stephanie Hazard, Jenna Hansen and Kat Stroinovsky. Finals action: Whitty leads Osborne in the Harken Womens International Match Racing at the CYCA. Image copyright David Brogan. Lucinda Whitty, representing Royal Sydney Yacht Squadron, and her crew of Stacey Jackson and Nina Curtis, have won the Harken Women’s International Match Racing Regatta in convincing style with three straight wins in the Grand Final. Starting the day with her semi-final against Jessica Eastwell (RPAYC), Whitty knew that she had to bring her 'A' game to the race track. A penalty during pre-start showed early nerves, and with both skippers being OCS, Whitty was able to wipe off her penalty as Eastwell took longer to return to the start line. From there, Whitty went on to win the match. Whitty took the next match of the semi-final convincingly by 45 seconds to set up a Grand Final match up with Samantha Osborne from Royal New Zealand Yacht Squadron. 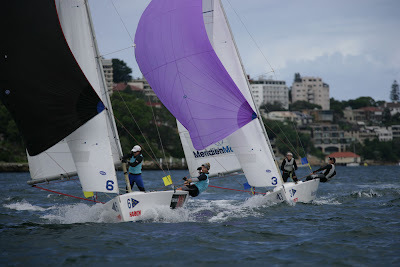 Osborne secured a second win in her semi-final match over Olivia Price (CYCA and Australian Women’s Match Racing team). Celebrations as Whitty wins Harken Womens Match Racing. Image copyright David Brogan. Three closely fought matches against Samantha Osborne later, Whitty was declared the winner of the Harken Women’s International Match Racing Regatta. It was the last match of the day that had everyone talking. Whitty and Osborne displayed some of the best match racing skills and tactics; using obstructions on the course and ‘dummy tacks’ to try to outwit each other. Whitty was to win by only seven seconds after a tight spinnaker run to the finish line. “We’ve used this regatta as a stepping stone to the team’s European tour and I am really happy with our performance. My thanks to Harken for their continuing sponsorship of the regatta and to all the race officials, umpires and the host club,” Whitty concluded. In the Petit Final, Price dominated the two matches against Eastwell. Price got the early lead in first match and headed wide to the lay line with both skippers tacking up the course. Price got a good downwind run to the bottom mark with Eastwell receiving a penalty at the top of the course, which allowed Price to get away. Eastwell carried the penalty until the finish line, but spinnaker issues on the finish line delayed the turn. In the second match, Eastwell received a penalty in the pre-start and used the puffs of breezes coming from the left hand side of the course in an attempt to gain enough off a lead to wipe off her penalty. The penalty would remain until the second leg of the match at the top mark, but Price got the better spinnaker run to the finish line and won by 16 seconds and secured third place. “It was a very hard fought third place against fellow Australian Women’s Match Racing Team members. I’ve found it really interesting to be on the helm this regatta – It’s a totally different mindset to mainsheet or bow. Congratulations to Lucinda and her team,” Price concluded. “Congratulations to Lucinda and her crew, and to all the women participating in this regatta. I look forward to welcoming all the competitors back again next year,” Watson concluded. Racing was again conducted in Rushcutters Bay with sou’easterly breezes of 12-15 knots. 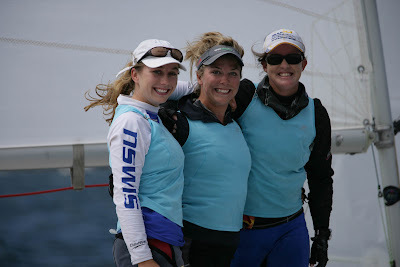 Harken Women's Match Racing Regatta Winning team of Lucinda Whitty, Nina Curtis and Stacey Jackson. Image copyright David Brogan. A prizegiving was conducted at the Cruising Yacht Club of Australia, the host club for the Harken Women’s International Youth Match Racing Regatta. At the beginning of her forty-first day at sea in her bid to conquer the Jules Verne Trophy, Groupama 3 is finally benefiting from some favourable weather conditions. However, God knows that the crew has had to be patient before they could once again make the kind of speeds worthy of a 32 metre maxi trimaran. Indeed they are now in a position to begin making up the ground on the current Round the World record holder. In its guise as the final geographical reference of this record, the equator is just a little ahead of them now as Cammas and his crew prepare to take on their final week at sea. Blue seas and heat, a mild E'ly wind and tropical sunshine, such is the weather Groupama 3 has been enjoying offshore of Recife, beam onto the wind: "We've been slipping along nicely since late yesterday and we're back in slightly more favourable conditions to make good speed. We're in a good phase now with 15 knots of breeze and the boat is making 28 to 30 knots of boat speed. The sailing conditions are very mild. When we're all on deck at the same time, we have some very enjoyable moments together" admitted Thomas Coville, during the daily radio link-up with the Paris HQ for the Jules Verne Trophy. Positioned 430 miles from the line separating the South Atlantic and the North early this afternoon, the maxi trimaran is now performing as she should now that she's done with the rather unfavourable tack changes, which she'd been linking together since rounding Cape Horn on 4th March. Benefiting from her power (22.5 metre beam) and her large sail area (550 m2) in relation to a weight of just 18 tonnes, Groupama 3 is sailing twice as fast as the wind strength. At this pace, she has made up 54 miles on Orange 2 in the space of 13 hours, that is over 4 miles gained every hour. Not surprisingly such a performance is giving this very top level crew a good boost: "We're in great spirits and we're going to give it our all until we cross the finish line. From a physical point of view, we're feeling fairly rested and Groupama 3 is in tip-top condition, sailing at 100% of her potential. For the time being we're still taking things step by step, as you would a hurdle race where you have to get over various obstacles. Today is coloured by the tradewinds. The next stage will be the equator then the Doldrums... We're not thinking too far ahead as that just puts unnecessary pressure on us." As such we can't count on Thomas Coville to give us his prognosis of Groupama 3's chances of crossing the finish line off the island of Ushant before Tuesday 23rd March at 0714 hours. Hardened long-distance racers, the ten crew are respecting the plan of action set by Franck Cammas to the letter: "Since setting out on this Jules Verne Trophy, we have always been sparing of our steed, even if it means not choosing the fastest course. At times that was frustrating but the upshot of that is that the boat is in perfect condition." Still highly attentive to developments in the weather, the group coming on watch always start out by visiting navigator Stan Honey to get instructions for the next two or three hours they'll spend on deck: "This exchange is essential to performance because, in contrast to what you may think, there is a great deal to be won or lost according to the way in which you helm and trim the sails. We're highly concentrated" concluded Thomas Coville.